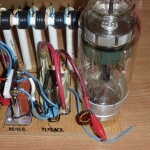 To use my Hydrogen Thyratron in a relaxation oscillator, I had to build a Pulse forming network, an array of capacitors and inductors that can store energy and discharge it via the thyratron tube working as a switch, in the load I choose : a tesla coil primary, a pulse tranformer, a magnetron, etc. “A Pulse Forming Network (PFN) accumulates electrical energy over a comparatively long time, then releases the stored energy in the form of a relatively square pulse of comparatively short duration for various pulsed power applications. In practice, a PFN is charged by means of a high voltage power source, then rapidly discharged into a load via a high voltage switch, such as a spark gap or hydrogen thyratron. The load may be a high power microwave oscillator such as a klystron or magnetron, a flash lamp, or even an electromagnet. Depending upon the application, the output pulse repetition rate may range from a fraction of a Hertz to over 10kHz.” (source). Simple oscillator circuits called relaxation oscillators may be created with a resistor-capacitor charging network (Pulse forming network) and a hysteretic device connected across the capacitor. Electrical hysteresis is the tendency for a component to remain “on” (conducting) after it begins to conduct and to remain “off” (nonconducting) after it ceases to conduct. 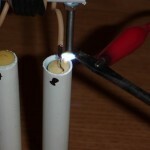 Simple gas-discharge tubes such as neon lamps exhibit electrical hysteresis. 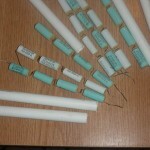 More advanced gas-discharge tubes have been made with control elements so that their “turn-on” voltage could be adjusted by an external signal. The most common of these tubes was called the thyratron. A pulse forming network can be created using various topologies for the components involved: capacitors and inductors. A complete list is available here. For my implementation, I decided to build a type E PFN. 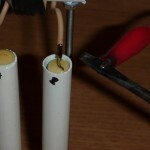 The coils have been wound on a single PVC form to adjust the mutual coupling. I will be using this PFN for a thyratron relaxation oscillator. The PFN is charged with a high voltage power supply, built with a royer (zvs) inverter driving a flyback transformer. 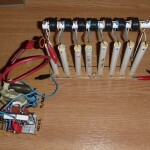 I am using 8 16KV 0.8nF capacitors (created using 4 4KV 3300pF caps in series) and 7 inductors of aprox 15uH . 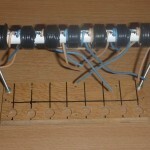 Each coil was created by wounding 15 turns of 0.75mm wire on the 1cm diameter pipe. Where can I see full schema with thyratron?